Introduction: Diverse uses of Starch make it a very versatile product. Maize or Corn Starch is a typical cereal starch with distinctly low protein and ash contents. Its carbohydrate content of high purity makes it useful in several industries. Starch occurs in nature in many ways. Maize contains about 71% of starch, which can be separated from other ingredients by various processes such as corn wet milling – steeping, grinding, purifying and drying. The physio-chemical and functional properties of starch exhibit a wide variation with slight change in the production parameters. One of the important properties is the viscosity of starch thus making it possible to have diverse uses. Maize Starch exhibits all the properties of native starch with some special features such as non-foaming & non-thinning characteristics of boiling solution. Hence maize starch has a marginal effect on the efficiency in weaving and paper industry. Where high viscosity starch is used, it imparts higher tensile strength to the fibre and thus improves the sizing. Combined with resins, starch produces a permanent finish. Good binding capacity results in its use as a good filler and binder in tablets. It is also a vital additive for most of the adhesives due to these properties. In slurry, it provides body to food products. It also helps in retaining the viscosity of foods. Besides this, it is excellent filler in cosmetics by virtue of its smoothness in dry form. It also participates in Maillard’s reaction in presence of proteins and thus gives the brown colour in bakery products. 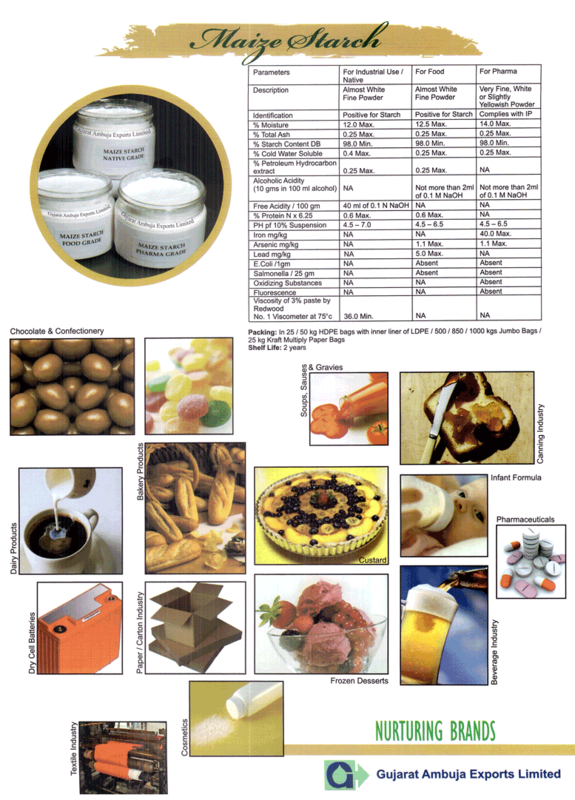 Glucose syrup: Dextrose Equivalent of between 40 and 60: food industry, Beverage and confectionary industry, Used directly as a substrate for the manufacture of fermentation products, (such as citric acid, lysine or ethanol or glutamic acid, Processed into other major starch derivatives such as iso glucose, fructose syrup etc. Substituted starches (starch esters, ethers, cross-linked starch): Textiles, Paper, Water treatment (flocculation, Oil industry (fluid loss reducer). Degraded/Converted: Dextrins: Adhesives (gummed paper, bag adhesives, bottle labeling, Textiles) textile fabric finishing, printing. 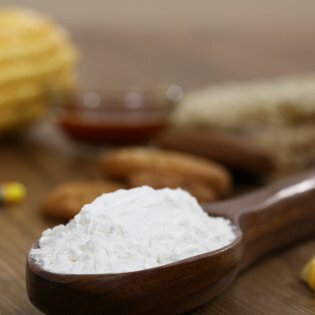 Roast dextrin, oxidized starch, thin-boiled: Acid-modified starches: Food industry (sweets) and Pharmaceuticals, Oxidized starches: Food and paper industry (surface sizing, coating), Textile industry (fabric finishing, warp sizing), Enzymatically converted starch: paper industry and fermentation industry. Cross-linked starches: Food industry (desserts, bakery products, soups, sauces, Textile industry (printing, Adhesives, Pharmaceuticals. Cold water solubility 0.4%max 0.25%max N.A. In 25/50 Kg HDPE bags with inner liner of LDPE, 1 MT Jumbo bag packing, 25 kg Kraft Multiply paper bags.